Failure of blast-loaded building facades and window systems cause many of the injuries reported after bombing events and accidental explosions such as the 1995 Oklahoma City Bombing, the 2011 Oslo Regjeringskvartalet Bombing, and the 2015 Mexico City Hospital gas explosion. As building facades continue to incorporate larger areas of advanced glazing elements, the probability of human injuries or fatalities from glazing debris increases. Therefore, design requirements for accidental and deliberate attack are becoming more prevalent for window and curtain wall systems. Protection Engineering Consultants (PEC) partnered with Enclos Advanced Technology Studio to develop the Window (hazard) Analysis Module (WhAM), a fast-running, web-based design tool for blast-loaded curtain wall systems. An initial phase of this effort included five full-scale shock tube tests. These tests were performed as part of the proof-of-capabilities study in the WhAM development. Enclos provided eight identical conventional window assemblies including glazing, mullions, and connectors designed solely for wind and gravity loads. This paper presents comparisons of analysis predictions and shock tube test results from the dynamic test program. 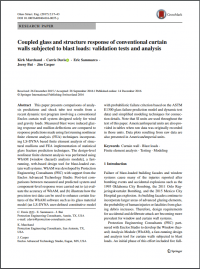 Measured blast wave induced glazing response and mullion deflections are compared to response predictions made using fast running nonlinear finite element analysis (FEA) techniques incorporating LS-DYNA based finite element analysis of structural mullions and FEA implementation of statistical glass fracture prediction techniques. The design-level nonlinear finite element analysis was performed using WhAM. Post-test comparisons between measured and predicted system and component-level response were carried out to (a) evaluate the accuracy of WhAM, and (b) illustrate how the precision test data can be used to enhance certain features of the WhAM software such as its glass material model (an LS-DYNA user-defined constitutive model with probabilistic failure criterion based on the ASTM E1300 glass failure prediction model and dynamic test data) and simplified modeling techniques for connection details. Read the PEC Publication by Kirk Marchand, P.E., Carrie Davis, P.E.,Dr. Eric Sammarco, P.E., Joeny Bui and Jim Casper.